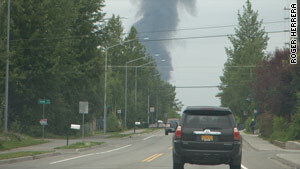 Smoke from a cargo plane crash in Alaska rises through the trees. (CNN) -- All four airmen on board an Air Force C-17 were killed when the cargo plane crashed during a training mission near Elmendorf Air Force Base in Alaska on Wednesday, the Air Force reported Thursday. John Pennell, a spokesman for Joint Base Elmendorf-Richardson, said the names were being withheld pending notification of relatives. He said the names might be released Friday. The aircraft, assigned to the 3rd Wing at the base, crashed about 6:14 p.m. local time, Air Force Capt. Uriah Orland said. Air Force Lt. Gen. Dana Atkins confirmed that the C-17 was a part of a demonstration practice for the 2010 Arctic Thunder air show this weekend. No decision has been made regarding whether the air show will continue as scheduled. In a statement Thursday, 3rd Wing commander Col. John McMullen said, "Our deepest sympathy and sincerest condolences go out to the family and friends of those airmen killed in this crash. Yesterday, we lost four members of our Arctic Warrior family and it's a loss felt across our entire joint installation. Right now, our immediate focus is on providing all possible support to the loved ones of our fallen aviators. We are also engaged in a deliberate investigative process." Witnesses say they saw the aircraft flying low over the hillside followed by a giant plume of smoke. Gov. Sean Parnell issued a statement expressing his sympathy for the crash victims. "Alaskans are very connected to the military and our thoughts and prayers are with Alaska's Air Force family," Parnell said. A stress management team was dispatched to the base to help anyone who may have suffered trauma as a result of the crash. A board of officers will investigate the accident, Orland said. Pennell said he expects a lengthy investigation. "We've got a bunch of investigators that are combing the accident site," he said. "It will take a while."